Well, I didn't win the Marie-Therese Dress. I am slowly recovering from the disappointment. Sarah from Stella Jade is here to help. Meet her new Marie Antoinette Jewelry Collection. She is giving away this gorgeous necklace one lucky reader. But you have to be creative and work for it. She is looking for a name for this bracelet and necklace pair. The winner will be chosen who comes up with the most original and perfect name. Sarah is amazingly talented and is married to her high school sweetheart. 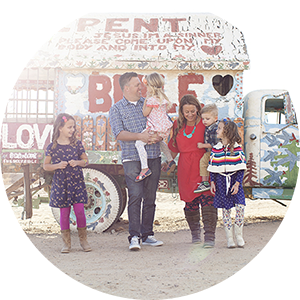 She stays home with her sweet 9 month old daughter McKenzie and finds time to fit creating into her everyday life. She has dabbled in sewing, business card and invitation design, and has now found her passion in creating jewelry pieces. Visit her blog and her Etsy shop to see more brilliance at work. The winner will be choosen on Thursday. Get thinking and leave your answer in the comment section below. Cotton Candy! It's sweet and beautiful! That would be a great name! "Dark but lovely" from Song of Solomon. 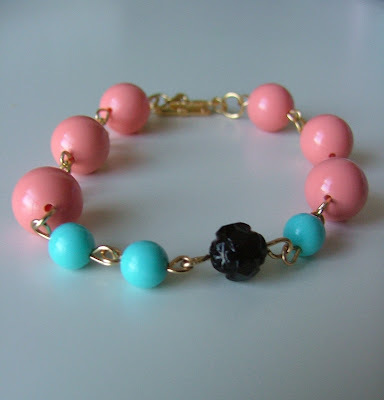 It seems like a treasure with seasons of beauty (pink) peace (aqua) but refinement (black) as well. It is a conglomerate of all three. The necklace was designed for Louis the XV who wanted to design a necklace for his mistress, Madame du Barry. It took several years and many types of jewels to create this necklace. While the necklace was being made, Louis the XV died of smallpox and Madame du Barry was sent away. When Louis the XVI became king, the jewlers tried to give Queen Marie Antoinette the necklace but she refused to wear another woman's necklace. "Pink and Aqua sisters" in honor of the two mommie groups (the pink aprom sisters and the aqua apron sisters) who love each other and throw fabulous parties for each other!! I don't know but when I looked at it, the name "Sunrise" came to mind. I guess because those were the colors on the horizon the other morning when I watched the sun rise. The trees and marsh grass were black, the horizon a pinkish peach and the sky a brilliant shade of blue!!! "let them eat cake!" should be the name! those are GORGEOUS by the way!!! :) xo! Beautiful! “Pink Atoll” is what I would call this necklace! How about 'Forget Me Not' since it is such a sweet and charming necklace! 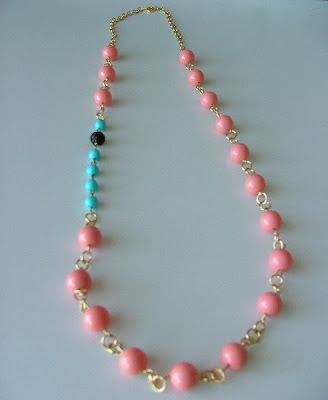 The pink and the blue beads, coupled with the timeless style of the set, seem very romantic to me. Just beautiful! "Sweet Delights" it looks like yummy candy!!! Pocket full of posies...just because I'm corny like that. "hope springs eternal" - I love that the necklace has just one bit of black which my eye is immediately drawn to. It reminds me that life is mostly filled with pinks and blues, but my eye tends to always go right to the black.... wearing this necklace would remind me both to enjoy the pink and blue and appreciate what the black adds to the finished piece... Hope that wasn't too long.